EndWarts PEN Solution Review: Go For Alternative? EndWarts PEN and solution by Meda Ireland are over the counter products for wart treatment. But are EndWarts products effective in removing HPV warts, including genital warts? What about medical studies on the efficacy and safety of EndWarts ingredients? Let’s jump right in to review through. EndWarts Review: How Does It Work To Remove Warts? 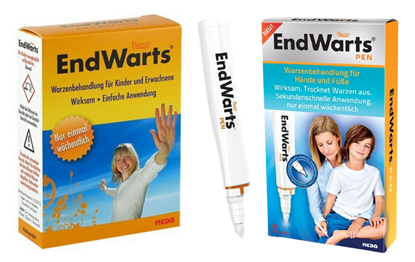 EndWarts contains Formic Acid (FA) which can be used to get rid of warts on hands, feet, elbows and knees. the EndWarts FA topical solution is absorbed directly into the wart, which helps the body to dry out the warts from the inside. What Do Experts Say About Ingredients of EndWarts? The Formic acid in EndWarts PEN solution is the simplest carboxylic acid that is most commonly found in the venom of ant and bee stings in nature. Industrial purposes – eg. leather production, dyeing of textiles, rubber manufacturing, etc. Agricultural purposes – used as food additive, antibacterial preservative and pesticide, etc. Toxic by all routes of exposure. Inhalation causes irritation of the eyes and nose with sore throat, cough, headache, and tightness of the chest. Ingestion causes burning of the mouth and throat, difficulty swallowing, vomiting and stomach pain. Exposure to skin can cause burns to the skin layers. Since Formic acid is corrosive, any product containing Formic acid (like EndWarts) must be used with great caution. As EndWarts PEN solution contains strong Formic acid that can cause skin damage with excessive dosage, it is important to follow its application instructions to avoid skin damage. EndWarts is corrosive with a strong smell that can be irritating to respiratory organs and eyes. Do not smell the content in the bottle. Side effects can for example be irritation in the respiratory system and/or throat, runny nose, runny eyes or difficulty in breathing. Do not cover the treated wart (with a plaster for example) when using EndWarts as it may cause soreness, tenderness, or skin damage. Do not overdose: Incorrect application or excessive dosage can cause pain and skin damage. 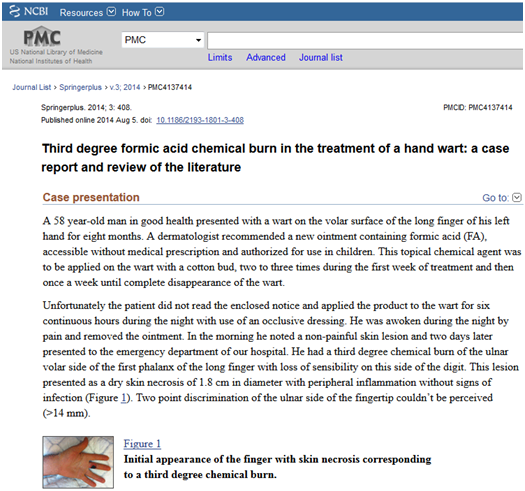 When excessive dosage, incorrect application or spillage stronger skin reactions can occur, for example blister, wound, dark pigmentation of skin, chemical burn, inflammation, tissue death (necrosis) or scar. Less serious, temporary side effects can occur, on the application site, for example tenderness, stinging, pain, redness, burning sensation or bleeding from blood capillaries. EndWarts must NOT be used for treating facial warts or genital warts. User Reviews: Is EndWarts PEN Solution Effective For Warts? EndWarts PEN Price and Where To Buy: Boots UK, CVS, or..? 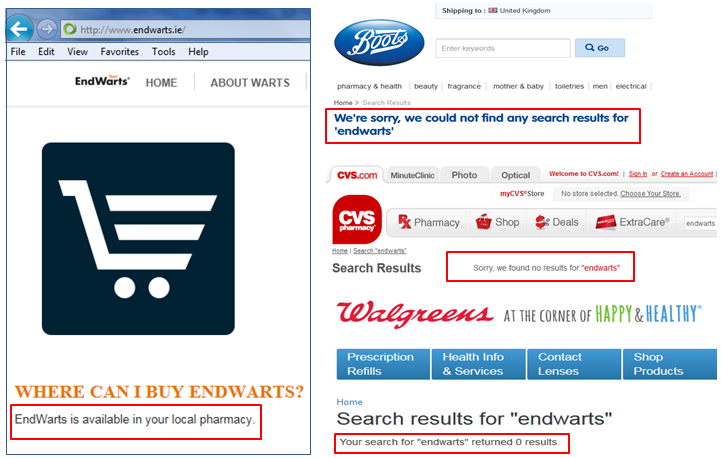 It is puzzling to see that EndWarts products are not available for sale even in top pharmacies like Boots UK, Walgreens, and CVS – as shown below. If you prefer wart pen, then Wartner pen with Trichloroacetic Acid (TCA) is a sound alternative. Customer feedback on Wartner pen results has been generally positive, with 4.1 out of 5 stars rating based on 259 reviews from Amazon UK verified customers. The customer feedback generally testified the product does what it says, and is #1 Best Seller at Amazon UK in wart removal category – as shown below. 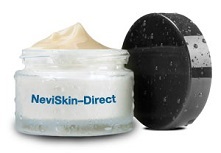 For those who are not comfortable with Acid-based over the counter products (like EndWarts and Wartner), then Nevi-Skin cream is a good option. Nevi-Skin by DermalMeds is a topical treatment cream formulated with natural herbal extracts, for removal of genital warts, plantar foot warts, common warts on hand and fingers, moles on the skin and face, skin tags and syringoma. ← Phytozine Ringworm Cream Treatment Reviews: Buy at Walmart CVS?